You will probably not believe it, but in the Balkans the lack of rule of law and the tolerance of corruption have some fun aspects. This is the case with the theft of the most contentious reform in Croatia by ... Montenegro. No, this is not a joke and it's not a product of a local satiric site. This is about word-for-word copying, with the Montenegrin language features at that, of the proposal for a comprehensive reform of the content of school textbooks, which is currently under violent disputes in the Croatian public domain and even threatens the survival of the government. To find out the magnitude of the irony in one case and the tragedy in the other, we need to rewind the tape a little bit. The Croats. 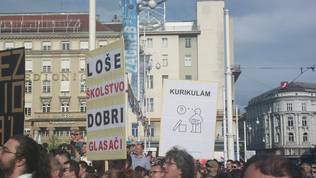 Last year, when the government of the then highly-conservative Croatian Democratic Union (HDZ) came to power, over 50,000 Croats protested in several cities across the country against the attempts to scrap the highly progressive and bold educational reform known as "curriculum reform". The reform was prepared by an expert workgroup of 500 people led by the young doctor of science Boris Jokić. The group was formed by the then left-liberal coalition government of Zoran Milanović. The idea for a ​​comprehensive education reform is embedded in a strategy voted in by the Croatian Parliament in 2014. With the coming to power of the HDZ, then under the leadership of Tomislav Karamarko - a conductor of ultraconservative and nationalist policies - there were attempts ideologically burdened people to be appointed. The sharp turn of Karamarko's HDZ to the far right, accompanied by brutal changes in the leadership of the national TV and radio, the Council for Electronic Media, and other activities pushing Croatia toward the illiberal group of Poland and Hungary, has led to significant quakes on the political arena and ultimately resulted in the fall of the government. Karamarko was replaced by former MEP Andrej Plenković, who promised to return the party to the centre-right of the political spectrum. He also promised many reforms, thanks to which he won the snap elections last September. Alas, one year later there are no reforms, and the first major challenge - the financial problems of the largest conglomerate not only in Croatia but also in the region of former Yugoslavia Agrokor – shook the government coalition. New snap elections were avoided after the liberal Croatian People's Party (HNS) agreed to take part in government, but on condition that the reform started by Boris Jokić is implemented. Andrej Plenković agreed to the horror of the liberals themselves, whose party split into two, but also to the more conservative wing in the HDZ, who insisted education remain in their portfolio. 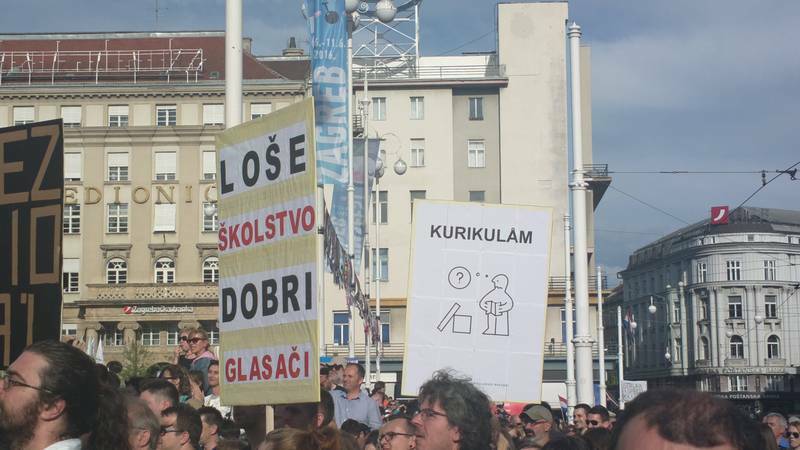 This happened after an anniversary of last year's protests was celebrated on June 1st, and in the centre of Zagreb, a few tens of thousands gathered again to confirm their demand for an education reform. Pressure on the prime minister by media and civil society is enormous. At the same time, his reluctance to say clearly who does he support in this inherent ideological conflict is obvious. He was, however, adamant in his reluctance to see new protests. For many, at least in the Balkans, education is probably not the most important topic, although it is, in fact, vital in the Croatian context. First, in an ideological sense, it is important because if it is implemented, it will tear the country away from Church-sponsored conservatism, which is often intertwined with nationalism. In the economic sense, it is no less important, as Croatia is currently suffering from a serious brain drain. 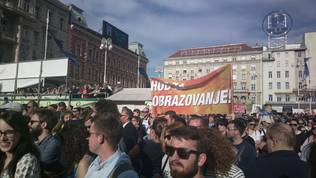 It is no accident that the organisers of the educational protest this year organised also a procession to Zagreb's central railway station to symbolise the departure of young Croats. The people of Montenegro. On Tuesday, the Croatian daily Jutarnji list revealed that the Montenegrin education institute has stolen verbatim the contents of some parts of Boris Jokić's curriculum reform. Plagiarism was discovered by accident by Croatian primary school teacher Ljiljana Hanžek, who worked on writing the reform. The Montenegrin Ministry of Education refused to comment on the case at this stage, but the education institute told Cafe del Montenegro news website that the Croatian document had been borrowed, but for technical reasons citing what Croatian literature was used had been omitted. 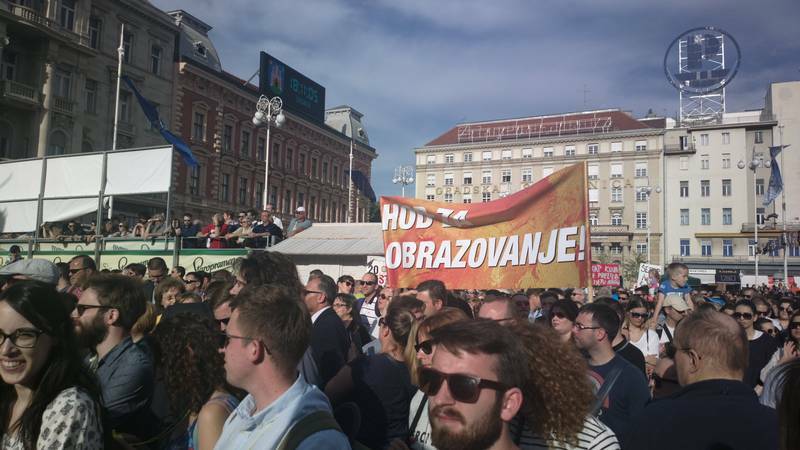 The case became an occasion for paraphrasing the well-known jokes about Montenegrin laziness: "The Montenegrins are lying down waiting for the Croats to make their reform", Croatians joked on social networks and the media. However, the authors of the curriculum reform are not laughing. At first, former expert group leader Boris Jokić reacted with mockery by saying that at least Montenegrins would benefit from the reform but he now believes Montenegro must pay royalty fees. Montenegro's interest in Boris Jokić's reform can finally provide Andrej Plenković with some insurance against internal party criticism. Conservatives in his party will find it increasingly difficult to explain to their voters and to taxpayers in general why they are opposed to such a valuable reform that has pulled out 50,000 people in the squares and has been the subject of theft by an official body of a neighbouring state. It will be a real shame for HDZ to reject a document that is considered of such a high quality by other countries. In the end, it may just turn out that Montenegro, with its plagiarism, will do a service to Croatia for which it should be rewarded, rather than made to pay compensations.